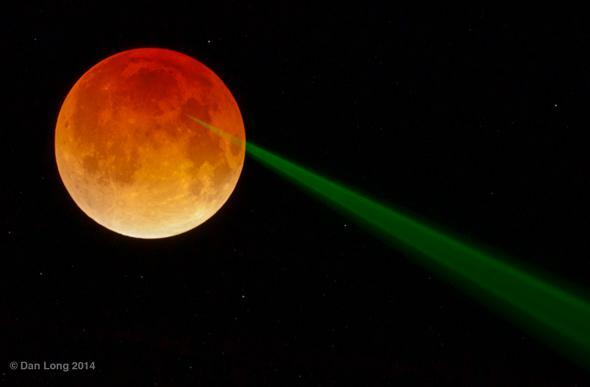 Laser ranging to the Moon: Zapping the lunar eclipse. Now witness the firepower of this fully armed and operational lunar ranging station! Click to midichlorianate. So there’s a picture you don’t see every day. Clearly, Vader’s forces were not at all happy about the lunar eclipse. I know, it really does look like the Moon was shooting out a laser at a passing ship, but that’s an illusion: In fact, that laser is hitting the Moon, and it was sent from Earth. While you and I were busy watching the total lunar eclipse on Monday, a bunch of astronomers were zapping it with high-powered lasers. They do this every now and again to find out exactly how far away the Moon is (and to provide yet another test of relativity). Apollo astronauts left a series of retroreflectors there, devices that are designed to reflect light back in exactly the same path it came in. If you shoot a retroreflector with a laser, the beam will come back directly at you. Over the course of 800,000 kilometers (500,000 miles) to the Moon and back the beam spreads out a lot, so a telescope is used to collect the photons from the laser. Since we know the speed of light very accurately, the time it takes for the beam to hit the Moon and come back tells us its distance. Think of it this way: If you are traveling at exactly 100 kilometers per hour, and you drive for exactly one hour, you know you drove 100 kilometers. Same thing here, but the car is a photon, the speed is the speed of light, and the distance is a wee bit more then you’d go for a family outing. Close-up of the laser shot (left) compared to a map of the Moon showing the Apollo 15 landing site (right; Apollo 17 is also listed). Apollo 15 landed on the very eastern edge of Mare Imbrium (the large dark circle; actually a lava plain), near the border with Mare Serenitatis. As you can see, the beam converges right at the Apollo 15 spot. I know it looks like the beam is coming from there, but that’s perspective for you! The beam appears to get smaller with distance, and your eye can’t tell if it’s getting smaller as it heads away, or getting bigger as it comes closer. Astronomers have been measuring the Moon’s distance for many years, and it’s from that we’ve learned the Moon is moving away from the Earth by about 4 centimeters per year due to the complicated interaction with Earth’s gravity. But today I learned something about this: During a full Moon, the amount of light reflected back from the Moon drops. This was a mystery for quite some time, but it turns out that’s due to the way the mirrors there are set up; the Sun shines down them and heats them up, and they lose their efficiency at reflecting light back to us. During an eclipse, though, the Earth blocks the Sun during the full Moon, so the mirrors don’t heat up. They reflect light back to us just fine, proving that solar heating was the problem. It’s funny to think that while I was collecting photons to make photos and video of the Moon, astronomers a thousand kilometers south of me were sending photons to the Moon … and getting them back. Tip o’ the X-Wing to Dan Long for letting me use his photo, and to APOD, where I first saw it. I’ll note this is at least the fourth time I’ve used a variation of this headline, and it’s funny every flippin’ time. Correction, April 20, 2014: I had originally attributed the photo incorrectly to Tom Murphy, who works on the ranging experiment.